Gold coins are the currency of Godville. 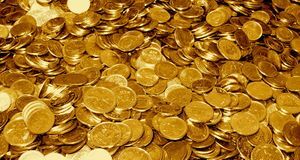 More commonly known as "gold," a hero can acquire gold coins in many ways. They can dig for them, find them on the corpses of monsters, win them in duels, and get them in a multitude of other different ways. A hero can use their wealth to purchase Equipment for themselves, for money makes the world go round. Once a hero has over 3,000 gold coins, they can forge a shiny new gold brick for their god's Temple with the help of an influence from their god. After a hero has completed their temple (which requires 1,000 golden bricks, a total value of 3,000,000 coins), 10,000 coins can be donated at the altar for a boost in experience points. The pantheon of savings is where the heroes are ranked for their wealth. The most thrifty heroes who on the mightiest savings accounts accounts appear near the top of this pantheon's rankings. When a hero saves 30,000,000 gold coins, they can even purchase a trader's license and become the proud owner of their very own shop. Gold coins are about the same size as chocolate coins. A typical chocolate coin has a thickness of 3 mm and a diameter of 25 mm. The coin can be approximated to a cylinder with a 12.5 mm radius and 3 mm height. Therefore, their volume can be calculated to 1.47 cm3. The density of gold is 19.30 g/cm3, so to find the mass of one coin we multiply 1.47 cm3 by 19.30 g/cm3 to give us a mass of approximately 28.4 g.
↑ A hero diary entry states, "Discovered that a handful of my gold coins were actually chocolate ones wrapped in foil. Yum!" The fact that the hero could not tell the difference between the two suggests they are the same size. ↑ Some are larger, and some are smaller, but this seems like a good average. This page was last edited on 25 March 2016, at 23:35.